Hurricane Irma passed over Clearwater Beach on Sunday night, September 10th and into Monday morning September 11th. High winds and rain swept over the region, frightening many who lived here. Early reports suggested the hurricane would strike us as a Category 3 or even Category 4 hurricane. To our fortune, that did not happen. The Florida Keys were struck with a hurricane at full force of Category 5. 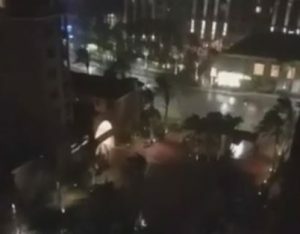 On landfall near Naples, Florida, the storm had dropped to Category 4. While a hurricane sweeping over land rather than sea might seem bad, the land weakens storms that are fueled by warm water. Passing upward through the state, the storm de-intensified quickly so that, by the time it reached the Clearwater Beach, St Pete Beach, Tampa Bay areas, it was a Category 1. That weakening was a blessing to our area. While we are clearly expressing relief, do not confuse that as a lack of concern for those to the south in places such as Fort Myers, Naples, and especially the Florida Keys. Our hearts go out to those who lost life and property to Hurricane Irma. We collected goods to send to Texas for Hurricane Harvey and we will continue by collecting goods for the Keys and others to the south of us who need aid. 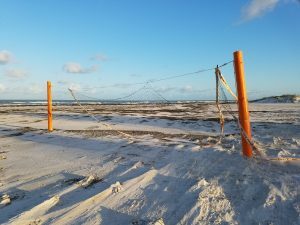 Sand has blown about the island but our storm surge was NEGATIVE ONE FOOT. That means not only did we not have a storm surge we had less than a storm surge. The winds actually blew water out of Tampa Bay, rather than in. We are very thankful for that fact. We experienced a few fallen palm trees, damage to cloth awnings and plastic signs, and lots of broken tree branches. Most of the fallen trees were inland, not on the beach, because the beach has lots of palms but very few oak trees. Electric power is out in some places but is expected to be back in full by Friday evening, Sept 16. Our message for those with plans to visit the Clearwater Beach area is to keep you plans. Clearwater Beach was hit so lightly, we expect the damage to be invisible in a matter of days. Many ways exist to help Florida recover. One of the ways is to keep your plans to visit, so long as you know the area you are going is not damaged or out of order or power. 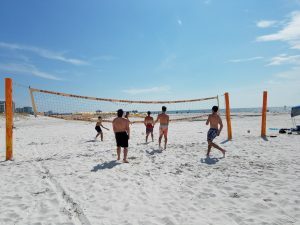 Clearwater Beach is open to the public, most stores are open, and gas is available. You can help our area to recover by keeping your vacation plans and helping our economy to continue, as uninhibited as possible. The post-hurricane weather, in fact, is quite nice. To see live videos covering the actual, on-site conditions of Clearwater Beach, please see our YouTube page here: YouTube. 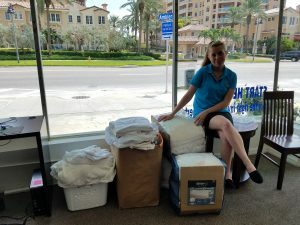 Naturally, you should send any aid you are capable of to the parts of Florida that were badly affected or, for that matter, to the islands of the Caribbean via trusted charities. We here at Florida Beach Rentals will be joining in those efforts by collecting goods in our lobby to send to storm victims.